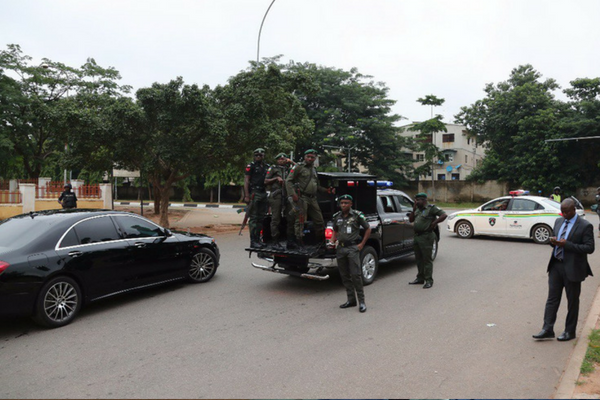 Security agencies are reportedly laying siege on the homes of Senate President Bukola Saraki and Deputy Senate President Ike Ekweremadu in Abuja. The move is said to be an apparent ploy to prevent them from making it to the National Assembly today because of an alleged plan by many lawmakers to decamp en masse from the ruling All Progressives Congress (APC). It was gathered that the security operatives stormed the Deputy Senate President’s residence in the early hours of Tuesday. The development comes as the Senate President Bukola Saraki is expected to report to the head of the Investigation Team at the Intelligence Response Team at Guzape Junction, Asokoro Extension, Abuja this morning. In a letter of invitation personally signed by the Inspector General of Police, Ibrahim Idris, on Monday, the police chief asked the nation’s Number Three citizen to appear before the police over his alleged role in the April 5, 2018 Offa Bank Robbery, which claimed over 30 lives. The invitation titled: ‘Case of Offa Bank Robbery and Gruesome Murder of more than 31 Persons and Snatching of 21 AK47 Rifles on the 5th of April, 2018’, the police boss asked the Senate President to appear by 8am today. As of the time filing this report, the whereabouts of the Senate President is unknown as he was said to have left his residence at Lake Chad Crescent, Maitama, Abuja before 8am. He is yet to report at the station. Be the first to comment on "Security Men Lay Siege on Homes of Saraki and Ekweremadu"